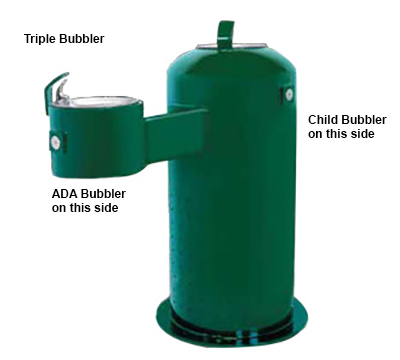 Triple Bubbler, one centered on top, one handicap accessible mounted on side, one child height mounted on side, 320 lbs. - One Bubbler in the top center of pedestal. - One ADA Bubbler on 20" side arm 36" above grade. - One Child Height Bubbler on 20" side arm 29" above grade. 18 inch diameter body with 22-1/2 inch base plate, 40 inches high, Triple Bubbler, One ADA Bubbler is on arm protuding 20 inches from body of the drinking fountain. Bubbler height is 36 inches. Second Child Height Bubbler is on arm protuding 20 inches from body of the drinking fountain. Bubbler height is 29 inches. Third Bubbler is located in the top center of the drinking fountain body.